PE Central presents our collection of online programs built to motivate children of all ages to become more physically active. The Log It Site debuted in Aug. 2001. It is age-appropriate for 4th grade and up. The program encourages students to record physical activity steps/miles online. It is not built to record activity minutes. The program features a virtual hike around the USA with stops at each state capital, students can set daily goals, compare their progress with others and they can compete in a Challenge Hike. Teachers can view their students UN's and PW's, add steps/miles for students, communicate with students and they can view their class and student progress. The Kids Quiz debuted in Aug. 2002. It is age-appropriate for 4th - 6th grade. It is an interactive, educational weekly quiz where kids test their knowledge about nutrition, health, and physical activity. Each week a new question is posted and kids have a week to answer the question correctly. Kids answering correctly are eligible to win a T-shirt prize in a weekly drawing. Kids not answering correctly are shown the correct answer and can come back the next day to try a new question. 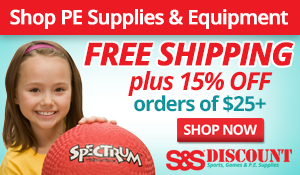 Prizes are mailed directly to the childï¿½s physical education teacher. The PE Central Cooperative Skills Challenge debuted in Jan. 1999. It is designed for 3rd - 8th grade students.. This program not only helps kids learn skills such as throwing and catching, it also develops their cooperation skills. There are 6 challenge tasks. Three are individual tasks (jumping rope, striking a ball with a racket, and hula hooping), two of the tasks require a partner (throwing and catching and a cooperative balancing task), and one task involves children working together to volley a ball as a team. Teachers register at PE Central and have several months to complete the tasks with their students. Students who pass 4/6 tasks earn a bronze, 5/6 tasks completed earn a silver pin, and 6/6 tasks completed earns a student a gold pin. Registration is FREE. The PE Central Cooperative Fitness Challenge debuted in October 2013. It is designed for 3rd - 8th grade students.. This program not only helps kids get more physically fit it allows kids to work together to complete the challenges so they are learning about teamwork. Teachers register at PE Central and have several months to complete the tasks with their students. Students who pass 4/6 tasks earn a bronze, 5/6 tasks completed earn a silver pin, and 6/6 tasks completed earns a student a gold pin. Reistration is FREE.